Back in December 2004, I talked about a new utility, then in beta, designed to simplify the task of copying files between Macs. Now officially released, 10base-t Interactive’s DropCopy 1.01 ( ; free for personal use; $25 site license) has improved significantly and has become one of my favorite Mac OS X utilities. Although Mac OS X’s Bonjour ( formerly Rendezvous ) technology makes it relatively easy to connect two local Macs together for the purposes of sharing files, you still have to set up Personal File Sharing and then manually connect from one Mac to the other, providing your name and password when prompted. When all I’m trying to do is get a Word document or a few photos from my desktop Mac to my PowerBook, that seems like a hassle. DropCopy simplifies the process by letting you quickly send files directly to other computers—or to particular users on those computers. As files are copied, DropCopy’s drop zone pulses and you see the percentage of the copy that has completed (the screenshot on the left). (If you’ve enabled DropCopy’s menu bar icon, the icon also indicates copy progress.) When the copy is finished, DropCopy notifies you with both text and audio (the screenshot on the right). That’s all there is to it—no network browsing, no Connect to Server, no usernames and passwords. The only hiccup is that if you’ve enabled Mac OS X’s firewall, you may need to configure the firewall so that it allows DropCopy traffic through; the company provides instructions for doing so. If you’re on public network, DropCopy’s preferences dialog allows you to disable the option to automatically receive files (so malicious users can’t fill up your hard drive with huge, unwanted files). You can also choose whether to display user names or computer names as targets in the drop zone. Unfortunately—and this is my one significant complaint about DropCopy—you can’t show both: If you’ve got two users on the same machine running Drop Copy, you’ll want to show users, but if you’ve got multiple computers containing the same user name, you won’t know to which computer you’ll be sending. Similarly, if you show machine name but multiple users are running DropCopy on that machine, to which user will the copy go? The developer could solve this problem by providing an option to display machine:user . 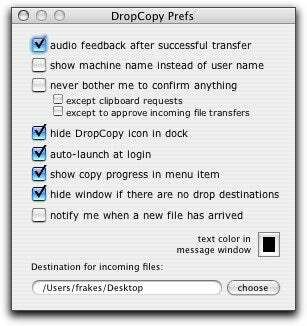 DropCopy also has two other useful features. The first is the capability to send text messages to other users running DropCopy; these messages appear in a pop-up window on the destination user’s screen. But even more useful is the ability to copy the contents of the Clipboard on another computer running DropCopy. You simply choose Get Clipboard: user/computer name from the DropCopy menu and the contents of that user’s Clipboard are copied to your own Clipboard. (The other user sees a dialog alerting them to your Clipboard copying, so you can’t use this feature to secretly steal information.) DropCopy doesn’t provide as many options in this regard as ClipboardSharing, but I still use it regularly to get text from one of my computers to another. The biggest caveat here is that, like many other file-transfer utilities, you can use DropCopy only with other computers that are also running DropCopy. But if you frequently copy files between two or more computers, it takes only a few minutes to install DropCopy on all of them and configure it to automatically launch at login; after that, it will always be running. In fact, it’s running on every computer in my house and office—it’s become one of the first things I install on any new Mac. DropCopy 1.01 is compatible with Mac OS X 10.3.9 and later; an older beta that works with 10.3.8 and earlier is also available.